The Drip Room hopes to work its way into the veins of the North Central Phoenix community with the opening of its second Valley location at The Colony, 5538 N. 7th St.
Customers enjoy a massage while getting a “boost” from IV wellness treatments at The Drip Room, which recently opened at The Colony in North Central Phoenix (submitted photo). The Drip Room provides wellness treatments that were once only available at the doctor’s office, now in a comfortable and social setting. The Scottsdale-based company’s proprietary blend of vitamin drips, boosters and B12 shots are said to increase energy, encourage better sleep and make skin more radiant. The Drip Room’s menu includes drips that promote energy, weight loss, immunity, anti-aging, detoxification, post-party recovery and more. For full menu and details, visit www.thedriproom.com. 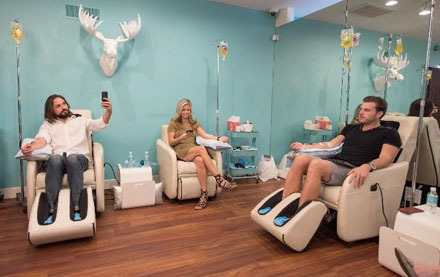 Guests also will enjoy an Oxygen Bar and Vitamin Bar of “cocktails” that are good for you, including drips, shots, boosters, wellness packages and more. It can all be enjoyed from the comfort of The Drip Room Lounge or relax in your own massage chair. The Uptown Phoenix location will be twice as big as the Scottsdale location, offering an expanded retail selection and also an Elixir Bar where health enthusiasts can enjoy a variety of shooters, energy drinks and detox items. The Drip Room opened early last month, while neighbor BURN Total Body Conditioning was set to open on June 1. BURN Total Body Conditioning, also located at The Colony, is powered by the Lagree Fitness Method, a practice developed by Los Angeles-based Pilates master Sebastien Lagree. The patented, all-encompassing method uses a Megaformer—a spring-based resistance machine—to channel an abs-burning, thigh-and-buns-shaking, total-body-conditioning workout that strengthens, lengthens and sculpts the entire body. The method offers a blend of cardio, flexibility, core, balance and strength and typically burns between 500 and 800 calories per session. These two new businesses join another recent health-conscious tenant at The Colony: Farm & Craft, a restaurant that focuses on healthy and sustainable food with several vegetarian and vegan options available.